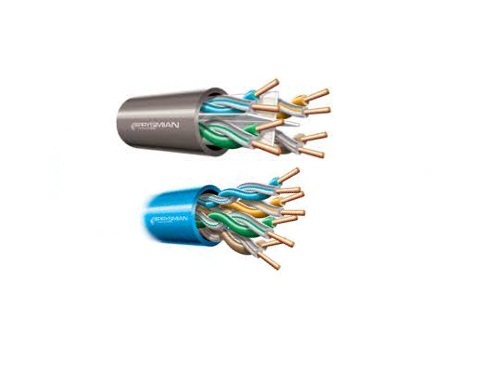 A range of Local Area Network (LAN) copper cables, with specifications to meet the requirements of Category 5E, 6 and 6A. 1/0.5 mm 24 AWG PACW, polyolefin insulated, twisted pair, flame retardant PVC sheath (75°C). ACMA and UL Verified. Nominal impedance 100 ohm. Tested up to 100 MHz, (tested up to 450 MHz on request). Velocity of propagation 67%. Blue Sheath. 1/0.57 mm 24 AWG PACW, polyolefin insulated, twisted pair, flame retardant PVC sheath (75°C). ACMA and UL Listed. Nominal impedance 100 ohm. Tested up to 250 MHz, (tested up to 600 MHz on request). Velocity of propagation 67%. Grey Sheath. 1/0.57 mm 23 AWG PACW, polyolefin insulated, twisted pair, flame retardant low smoke zero halogen sheath. ACMA and UL listed. Nominal impedance 100 ohm. Tested up to 500 MHz. Velocity of propagation 67%. Grey sheath.